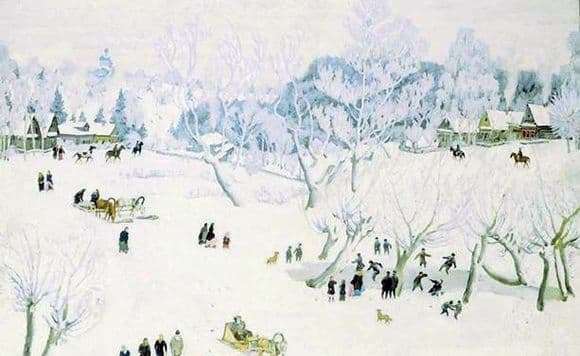 The painting “The Magic Winter” was painted by KF Juon in 1912. This period of the artist’s work was saturated with the theme of the Russian village. He praised the originality of the Russian people and showed the beauty of nature. The canvas shows the outskirts of the village. Nearby are unpretentious wooden houses, so typical of Russia. The village is surrounded by a forest where coniferous trees and Russian birch trees intertwine. In the distance you can see the dome of the temple, which speaks of the spirituality of the Russian people. Even in a small village, lost in the forest, there was necessarily a church. The weather is beautiful, a lot of people on the street. Perhaps this is a holiday and people are returning from the temple. One can see the silhouettes of horses, which are necessarily circled in the winter. On the street, women walk and frolic kids. Such a time for kids joyful, you can play in the snowballs and ride on the ice. They slide on the frozen water, which arouses curiosity among passersby. That rink attracts so much attention. The atmosphere is joyful and fun, the picture blows good. People communicate with each other, acquaintances met at the entrance hall, stand and talk. The picture is made in bright colors, the snow favorably emphasizes the shades of houses and the figures of people. The frost is silvered all around, the branches of the trees bend from the snow. Apparently the frost bound the whole village, but people are not afraid, they are having fun on the street. The artist managed to realistically convey the atmosphere of the holiday and fun. Looking at the picture, I just want to run through the snowy surface, play snowballs with the guys, go to the skating rink and inhale the frosty air, which gives strength and a feeling of complete freedom! One feels the breadth of the Russian soul and the openness of the people. The picture exudes revelation and naturalness. The artist showed the harmony between people and nature. Man is part of the world and it is possible to live without causing damage to the surrounding nature.